After what seems an endless silence the handsome Augustan head is raised, and Britain’s greatest film director explains what is on his mind. Anyone who ever worked with David Lean will tell you what it was like to be on the receiving end of those unreadable, unnerving silences. And yet he could be gentle, clear and supportive as well as utterly demolishing. The clarity of his explanations left no space for misunderstandings, especially with a script. ‘Never, never,’ Noël Coward told David, ‘come out of the same hole twice’, but after the success of Great Expectations Lean did just that. He decided his next film would be another Dickens novel, Oliver Twist. The four films before Great Expectations had all been Noël Coward subjects, and perhaps he needed to move on from Coward’s influence and show he could be his own man. He had already become known as a perfectionist, at whatever cost. 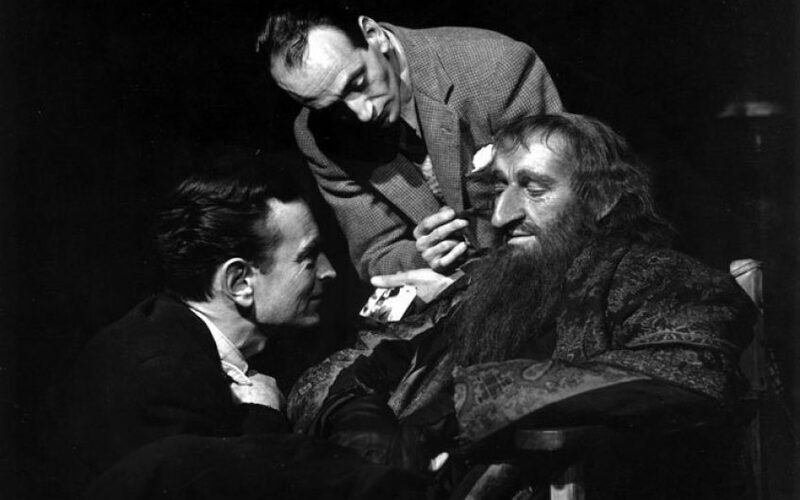 Alec Guinness, a youthful, wide-eyed Herbert Pocket in Great Expectations, was convinced he should be cast as Fagin. David thought it impossible, finding him charming but lightweight. Alec worked with Stuart Freeborn, the make-up artist, and they showed the result to David. It might have taken him a long time to make a decision, but when Guinness presented himself in costume made up as the old skunk Fagin, even David’s perfectionism was satisfied. John Bryan’s sets for Oliver Twist were inspired by Cruikshank, but also owed a nod to Gustave Doré, the French illustrator, as well as the Thameside warehouses with their sinister walkways high above the ground. The riverside warehouses were built on the back lot at Pinewood Studios and, with a bitter night wind blowing, a mass of extras assembled below, while the camera attached to the top of the rickety pile looked down on the Bill Sikes of Robert Newton – an actor much admired by David, with a well-known drink problem – and a cold and wide-eyed John Howard Davies. When I first started work in the cutting rooms David was a remote figure. My first brush with him could have been my last. I was asked to get the day’s rushes especially early from the laboratory, sync them up, and have them for him to see before he went on the set. He arrived in the viewing room bang on time and I gave the cue for the projectionist to start. Catastrophe! An assistant’s worst nightmare! The reel was out of sync. I shot to the projection box, made the correction as fast as I could and ran it again properly. When I’d finished David got up to leave and I stood in front of him, my life in films in his hands. ‘I’m very sorry, David. Dreadful mistake. I do apologise.’ For the first time David looked at me as if I actually existed. His eyes locked on mine for a Lean Special. Then, after a pause, he said, ‘Do it again and your balls will drop off.’ I’d been given a second chance. He had an instinct for knowing if a stranger came onto the studio stage without permission. He had huge ears and would pick up unwanted sounds in a flash. When work allowed, I would slip onto the stage to watch him, but he was aware of me at once. Sometimes he would beckon me over and explain in detail what lens he was using and why. Occasionally he would make me look through the camera and explain the difference between real life and what the camera saw. He was a generous and natural teacher. Later, I joined his cutting-room team and began what became a three-year apprenticeship. He was very patient, gentle and soft-spoken with his actors. He preferred to ‘suggest’ rather than to dictate what he wanted, though if an actor didn’t deliver he could turn bitterly against him. When he found an actor he liked he hung on to him – witness Alec Guinness, who was also in The Bridge on the River Kwai, Doctor Zhivago and A Passage to India, and John Mills in Hobson’s Choice and Ryan’s Daughter. David loathed Croydon, where he had grown up. He was backward at school, bad at sports, knock-kneed and pigeon-toed. He was in awe of his elder brother, who went to university and became a worldly success, while David developed a lifelong suspicion of intellectuals. But he loved cameras, and developing his own films. Eventually his father got him a job at Gaumont Studios. It was before sound, so rather than starting as a ‘clapper boy’, he simply held up a slate before each shot. We went one evening to a private screening of The Conquest of Everest. When we came out into a dark and damp Wardour Street David headed straight for the nearest pub. After we’d been served and after the usual long silence, he turned to me and said, ‘That’s the kind of film I really want to make.’ I was astonished, but he was a ‘son of the Empire’, born in 1908, nurtured by the Boy’s Own Paper and the Great British Adventure. Oliver Twist was the one film with which he had political problems. Alec Guinness’s costume, make-up, voice and nose caused a great affront, and Jewish spokesmen in Europe and America argued that it aroused anti-Semitism. ‘Being brought up a Quaker,’ David said, ‘I was blissfully ignorant of anti-Semitism.’ Three years later it was released with twelve minutes missing, and only now can Americans see it as it was supposed to be. Great Expectations won Oscars for Guy Green and John Bryan, directors of photography and art direction respectively. David enjoyed seeing his crew being praised, but demanded great loyalty from them; they gave it him – or were dismissed. To George Pollock, his first assistant – responsible for smooth working on the set – he gave a gold cigarette case with the titles of the films they’d made together and the inscription, ‘Please Sir, I want some more’. But David had to wait for his two Oscars – for The Bridge on the River Kwai and Lawrence of Arabia. David asked Jocelyn Rickards if she would design the costumes for Ryan’s Daughter. He wasn’t comfortable with sketches but he refused to stop off in London on his way to Ireland to check on Sarah Miles’s costumes. He didn’t like them, but he couldn’t explain why, or what he wanted instead. Every evening after shooting Sarah appeared in new clothes, and David would reject them. Nothing Jocelyn did pleased him, nor could he take criticism. That evening, when everyone gathered for drinks, David made a startling speech to Jocelyn in front of the assembled crew. His behaviour had been appalling, his treatment of her had been rude and unjust, he realised she had only been trying to help him and his film. Jocelyn felt she had to accept such a fulsome and rare apology, and stayed to finish the film. Steven had hotfooted it to David and told him that if he didn’t apologise Jocelyn would quit and the film would be in serious trouble. Years later, Jocelyn said, ‘You know you behaved appallingly, don’t you, David?’ He looked perplexed and, after searching his memory, he said, ‘I don’t owe you money, do I, Jocelyn?’ Everything else had gone from his mind. I was fortunate to know David for much of his long life. In that time he became rich and famous, married six times, won two Oscars and was made a knight. But when I remember him I still think of those seemingly endless pauses in which – or so I like to think – the rich legacy of his films was conceived. In his head were his films. They were his life.